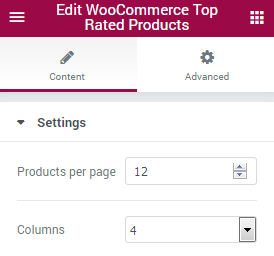 From this tutorial you’ll learn how to add WooCommerce top rated products using WooCommerce Top Rated Products JetElements module for Elementor. WooCommerce Top Rated Products module is useful if you want to showcase the products that have the highest rating according to the customers’ reviews. As a result, with this module, you can set the number of products to show per page and the number of columns to organize the products. Products per Page — here you can define how many products you want to display per one page using this module. Set “0” value to display all the existing products. Columns — here you can define how many columns you want to display in the module to organize products. You can set from 1 to 6 columns in order to display the products the way you want. Before using WooCommerce Top Rated Products module make sure that you’ve installed and activated WooCommerce plugin.